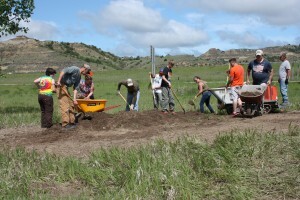 Thirty hardy individuals participated in the 2015 National Trails Day event held on the Maah Daah Hey Trail on Saturday, June 6, 2015. The day before the event up to 2 inches of rain fell causing creeks and rivers to run high. But the clouds cleared out on Trails Day providing a perfect day to surface a section of the trail from the intersection with I-94 near Exit 24 south to Andrews Creek, a distance of about 1/2 mile. 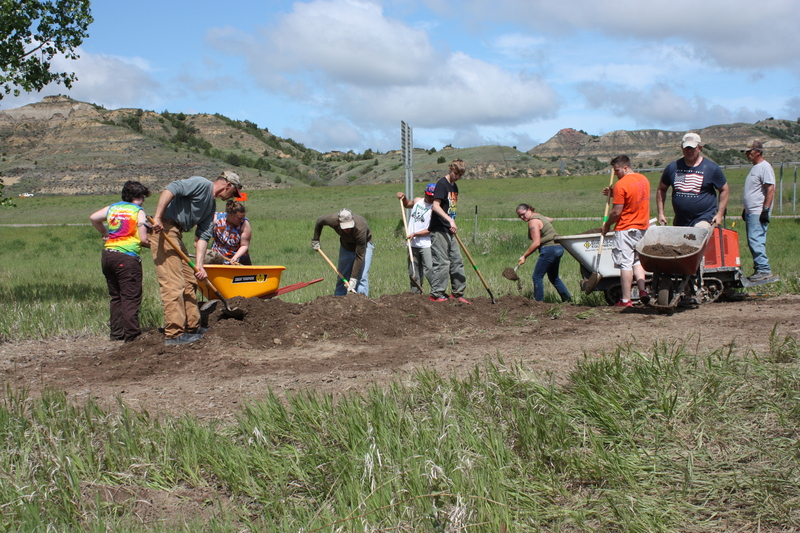 After spending the morning shoveling, hauling, and spreading gravel to surface the trail and clearing brush, participants gathered at Chimney Park in Medora to enjoy a picnic lunch and discuss other needs for the trail. This year’s trail event was sponsored by MDHTA and the US Forest Service. Don Mayer and Susan Mayer, Life Members of the Association provided the use of their electric cart to haul gravel as well as their barbeque grill to cook lunch. The 2016 National Trails Day on the Maah Daah Hey Trail is scheduled for Satur day, June 4. Scheduled time and location will be posted when it becomes available. Park in Trailhead Parking South of Medora! 2016 Trails Day – A Great Day, A Great Success!